Every year my family stuck to a very traditional Ukrainian Christmas. We ate the same meal on Christmas Eve, went to the same catholic mass on Christmas morning and had the cheese carousel, same breakfast before opening presents, for the first 31 years of my life. However, I do not regret a single moment. Especially, since it was a tradition passed from my Ukrainian great-grandmother to my grandmother. As the tradition torch was passed to her, she took great pride in her duties. We saw her as the flame that burned forever and we would not anyone else to lead the role but her. I, myself, saw my childhood in these traditions and knew I never had to grow up if we opened our stocking before our presents as we did every year. However, as the family started to grow more distant, the children grew older, the tradition weakened. 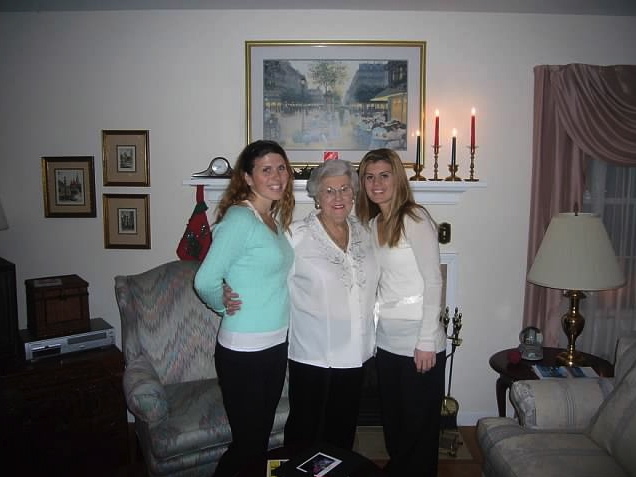 I continued to feel very strongly about practicing this ceremonial Christmas but with the loss of my Grandma Anne in 2012, everything changed. With her passing, I felt my childhood slip away, almost immediately. I knew the woman who made my childhood traditions important would no longer be there. It would not be the same without her and though caring her torch was important, we needed a few years to start again. So instead, that Christmas my mother and I decided to travel. 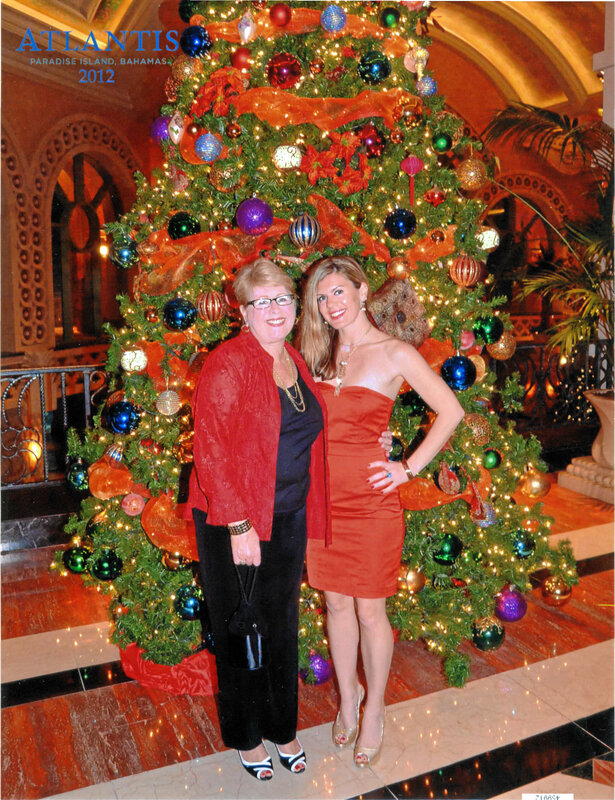 To a place far away from anything traditional and landed the farthest we could from a White Christmas, in the Bahamas. We loved the idea of going away so much that we decided to do it again this year in 2013, by meeting in my new home, Paris. Paris is incredibly beautiful, especially at night. It is true that Paris does not come alive until the sun goes down. Even without Christmas, the city is glamorous. The Eiffel Tower shines like the North Star as to luminate the entire Earth. I can never stop staring and the addition of shining white, blue and every other color light, I could have not picked a better time to start my adventure here. The city is the perfect place to spend Christmas. So, my expectations were high for the “City of Light.” It delivered in the tourist areas but noticed that actual Parisians, kept it simple. 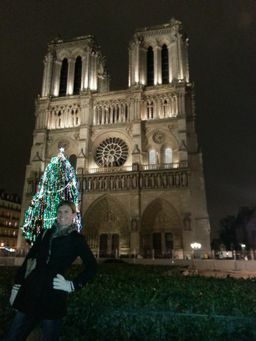 It had the glimmering lights, the Christmas trees, Santa and the window decor but even Notre Dame put out only one multi-colored tree and called it a day. Most of the decorations, in the real Parisian areas, seemed to follows this theme. They were incredibly simple depending where you look but if you want the spectacular Christmas glamour, it is here. 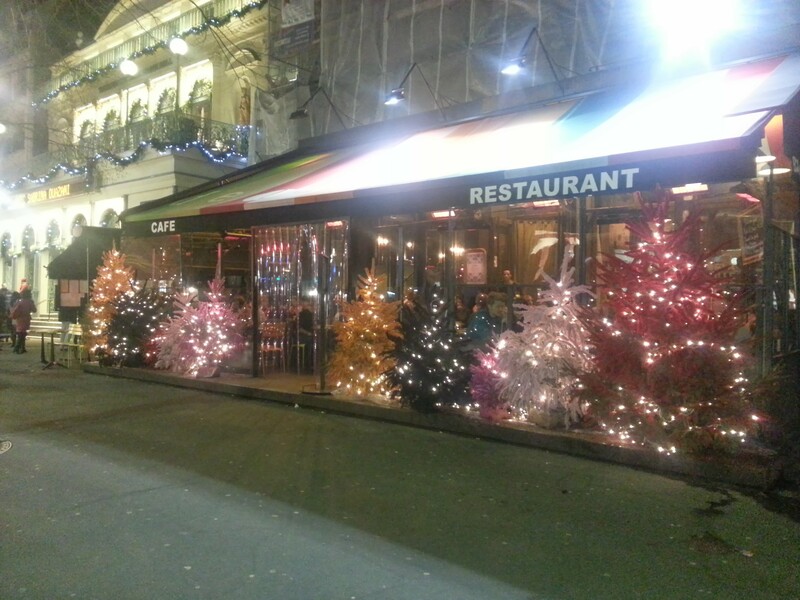 In the main tourist areas, the lights on the trees consist of white, blues and some multi color. Champs-Elysees, as it is already spectacular, luminated with the lights leading down to the Christmas market and the “La Grande Roue de Paris” as the picture perfect backdrop. I went to this market several times throughout the season and will continue do so as it remains open through January. 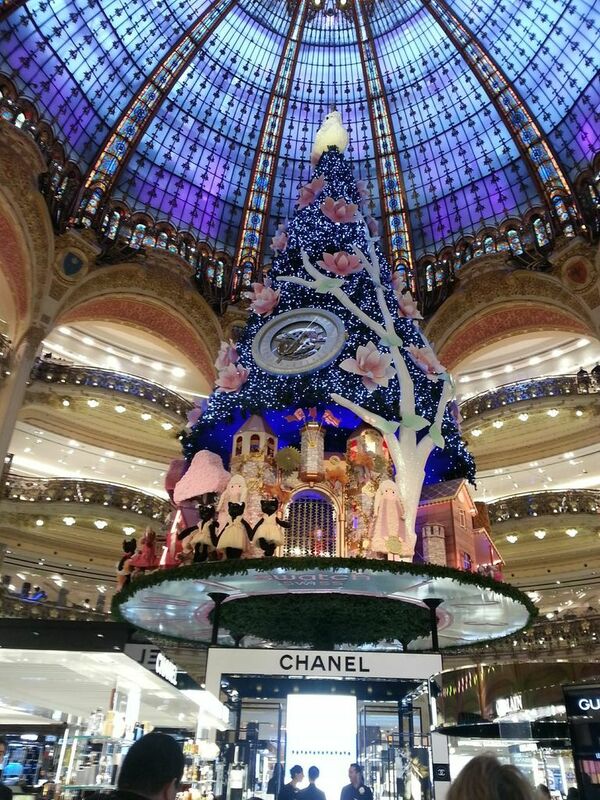 There are several markets all around the city but Champs-Elysess pulls together the most spectacular showcase in Paris. 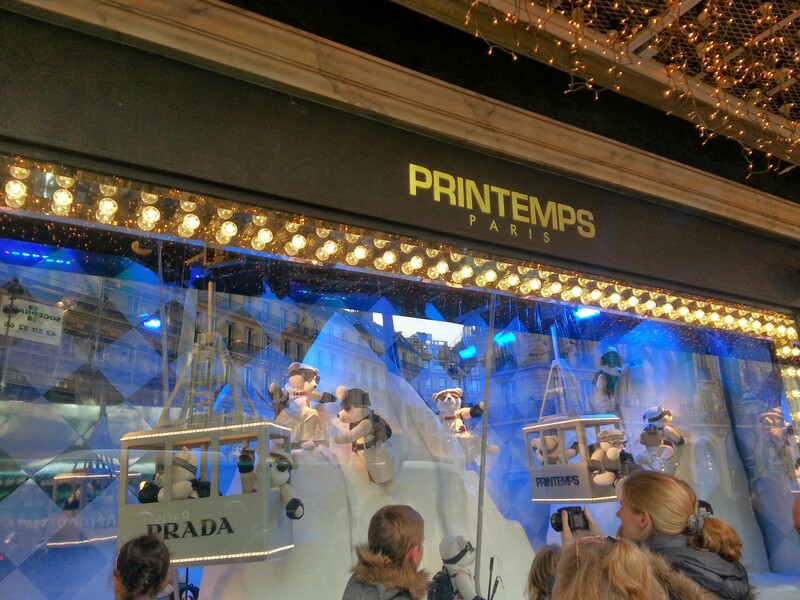 Printemps at the Galeries Lafeyette, luminates it windows filled with playful like dancing teddy bears, Nutcracker mice and “cool” Santa’s in black suits. Like in New York City at Saks Fifth Avenue, entertaining children all of all ages for hours. There are many of these decorations throughout the tourist areas but once you get to the more local Parisian areas such as Luxembourg, you will find the decorations simpler. Near my school off the Port Royal metro stop, there is a line of trees with large bows from last year’s presents, standing up without lights or ornaments. I also, found that many Parisians apartments had no lights outside. I believe keeping up with the historic nature of the buildings disallows this but you would sprinkles of apartments with trees lite inside. Even in the suburbs, the outside home décor was very far and few between. 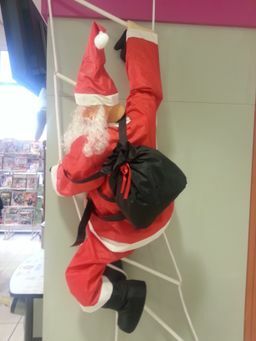 The one decoration I found that seemed to be the number one trend was Santa dangling from the balcony of an apartment as he was a cat burglar. I would pass by the apartments on the train, with Santa’s hanging all over for dear life. I found as classy as Paris is, this bit of goofy humor, made me respect them just a bit more. 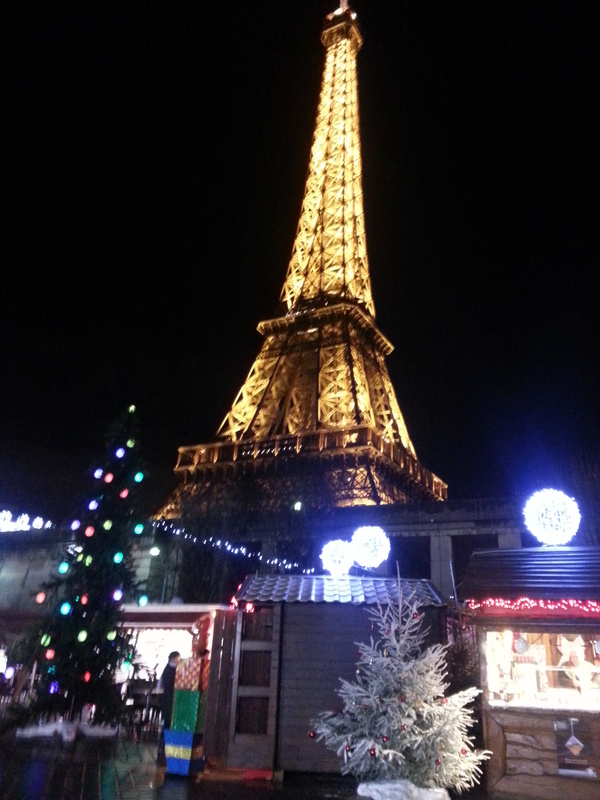 No matter, what the décor, there is plenty to do, if you want to spend Christmas in Paris. While you are touring around checking out the lights for yourself, ensure to grab a petit Bouche de Noel. 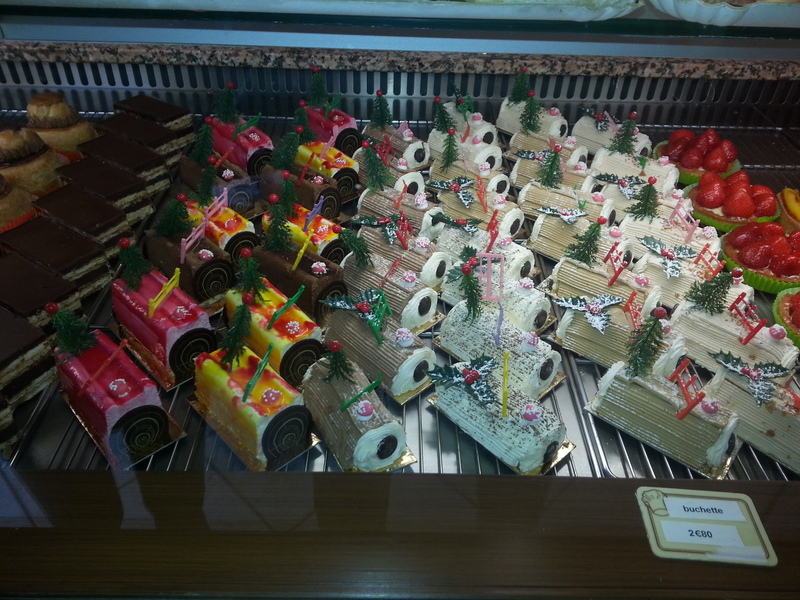 Every boulangerie I passed, they seemed to get tastier and more festive as I carried on the holiday the season. Though chocolate is the traditional flavor, the vanilla has put tasty holiday dessert at a new level. 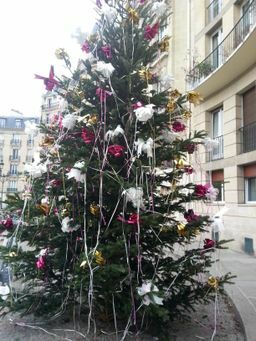 If you have moved to Paris and this is your first Christmas here, then finding a tree is not a problem. 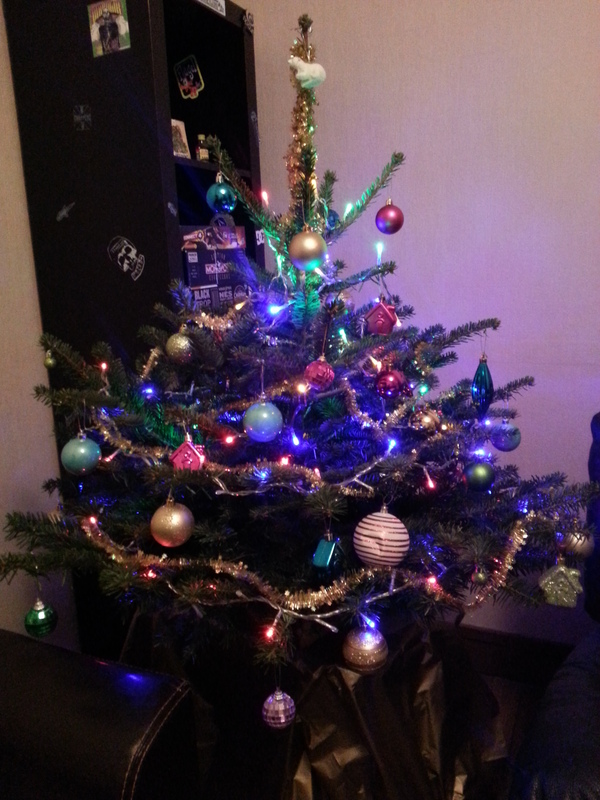 Just don’t expect to get the top of the ceiling, extravagant tree you are used to in the States. In the Paris limits trees start around 40 € but if you head into the surrounding suburbs, you will find one for about half the price. While you are there, head to the local Auchan or mall to pick up less expensive decorations and wrapping paper. If you wait till the weekend before, prices start slashing at 50% off. Whether you are just moving here or need to get away from the family, Christmas in Paris is a “one year I went to….” conversation necessity. Here are the top two places to see Christmas lights. Find separate posts on the top markets, Christmas Eve dinner and midnight mass at Notre Dame. 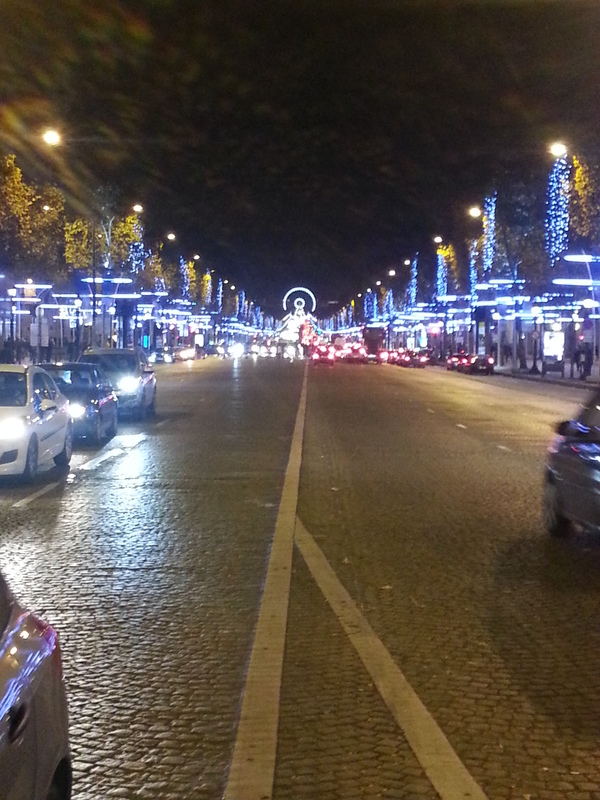 From the Arc de Triomphe down to the Le Grande Roue de Paris, the boulevards trees are lined with circles of blue lights leading up to the larger than life Christmas Market. If you want to walk the 30 minute line of glory, you can get off of metro stop Charles de Gaulle Etoile or if you want to shorten your walk Franklin D. Roosevelt will bring you much closer.